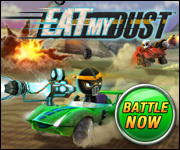 Eat My Dust is a 3D world centered on FAST cars, BIG guns, and EXPLOSIVE combat! Choose your team and fight for supremacy in this all out RACING COMBAT game! Players can choose from multitudes of unique car customizations and arming themselves with the latest high-powered ASSAULT WEAPONS. Once your car is fully modded and weapons are armed, it is off to COMBAT! Destroy ZOMBIES, ATTACK your fellow players, or let ‘em eat your dust as you RACE to 1st place! Wreak the maximum amount of HAVOC and MAYHEM to earn coins and buy FASTER cars and BIGGER GUNS! What are you waiting for? Get out there and BLOW SOMETHING UP! If you ever have any questions about EatMyDust.com or your child’s Eat My Dust character, please contact our friendly customer support team at support@eatmydust.com. HI, Aniyah – All you need to do is head over to http://www.EatMyDust.com to sign up for free and start playing. Before you launch the game, you’ll need to install the Unity web player found here: http://unity3d.com/webplayer/ . It’s a necessary component to launching the game, so be sure to start here. After you’ve successfully launched the game, you’ll be able to create your very own racing machine to drive around the combat zone. Our trusty dog wrench will show you all you need to know to get started. But be sure to check back into the blog to learn all about our regular game updates. Thanks for checking out Eat My Dust! I love this site but honestly (you can ask JumpStart) I come up with lots of good ideas.One of my ideas for you guys is to MAKE A COMMERCIAL is\t will get publicity and more people on YOUR site.And when you type in Eat my dust into the computer nothing comes up for this game.You guys should make a direct link. Thanks for checking out the Eat My Dust virtual world, Alano! We really appreciate your suggestions and hope you enjoy our latest game updates. This game is good for the kids so they should like it. Thanks for the feedback Amy! We are still working on growing the site and bringing players like you new games and places to visit, so be sure to check back with us here on the blog for all the latest information. Good luck on the road! I love Eat My Dust. It is a great website. I like it better then JumpStart or Math Blaster. Thanks for the world Eat My Dust creators. You really know how to make a virtual world rock. I LOVE eat my dust THANKS FOR THE AWESOME VIRTUAL WORLD. Hello! If you look at your control panel, you will see a bubble with 3 dots in it, on the left-hand side. Click on this, and you will be able to use typechat! However, your parents may have restricted your access to typechat, so make sure to check on that. Please let us know if you have any further questions, comments or concerns! We would be more than happy to help. In the meantime, we hope you keep on having some racing fun while playing Eat My Dust! Hi Kyle. We are sorry for the inconvenience. Could you please message us your email address that is registered to play the game and we will help you solve this problem as soon as possible. Thank you.